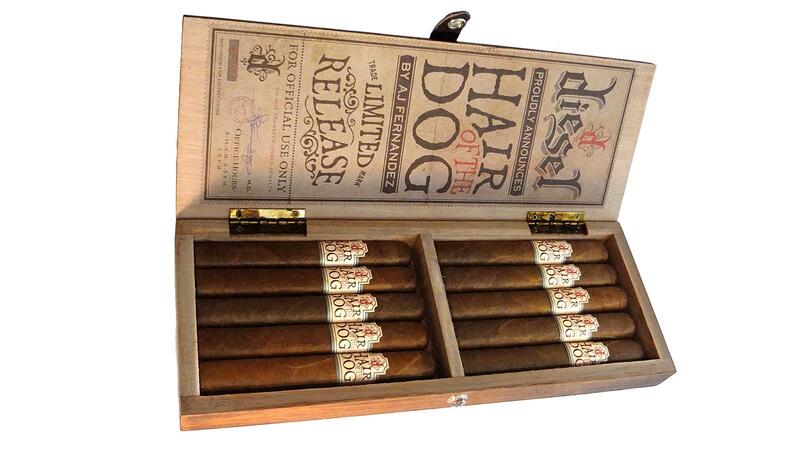 Diesel Hair of the Dog comes in one size, a 6 inch by 54 ring gauge, box-pressed Toro. As a follow-up to last year’s Diesel Whiskey Row, General Cigar has released Diesel Hair of the Dog, and the new smoke is starting to hit cigar shops now. Made in Nicaragua by A.J. Fernandez, Hair of the Dog consists of an Ecuador Sumatra wrapper, Ecuador Habano binder and Nicaraguan filler. The limited-edition cigar comes in one size, a 6 inch by 54 ring gauge, box-pressed Toro. They’re packed in rustic wooden 10-count boxes and will retail for $10 per smoke. Only 5,000 boxes were produced. Diesel is primarily a catalog brand sold through Cigars International and the line that made cigarmaker A.J. Fernandez popular. In 2017, General brought Diesel into the retail sector and created Diesel Grind just for brick-and-mortar tobacconists. Diesel Whiskey Row followed in 2018 as a collaboration with Kentucky-based Rabbit Hole Bourbon. Diesel Hair of the Dog is intended to be a medium- to full-bodied cigar.